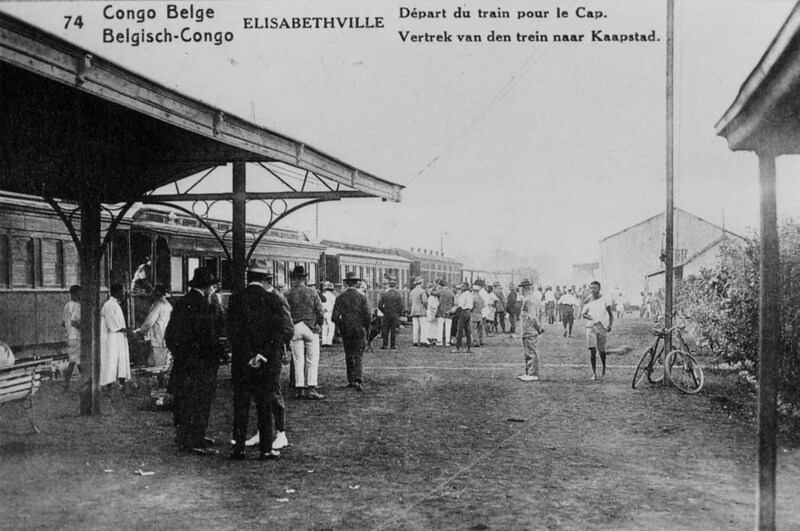 Matadi - Kinshasa (Leopoldville), Chemins de fer du Congo, at the end of the '30s consisting of a generator van and 5 cars, including a diner with CIWL service, traction by steam locomotives series 251-253 (2-10-0), all cars white. 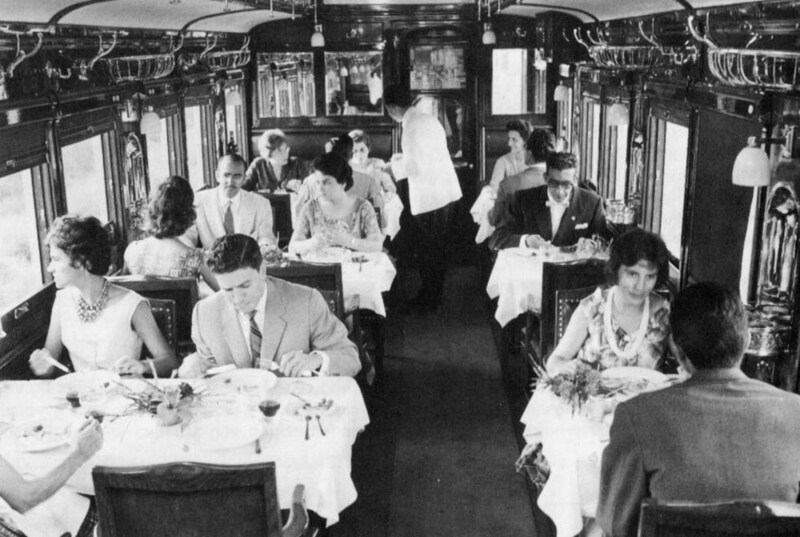 Towards the end of the 20th century there was the "Train Bleu", then simply "L'Express". 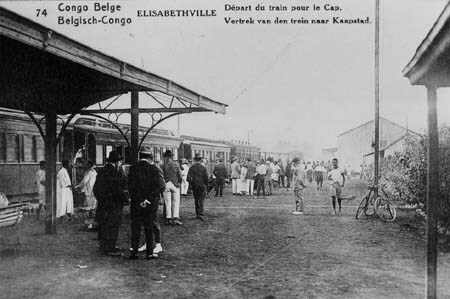 At Kinshasa there was the connection by river steamer to Ilebo, the former Port Francqui. Ilebo (Port Francqui) - Lubumbashi (Elisabethville), LKD/KDL sleeping and dining cars with CIWL service 1936-1963, colored brown/cream, from 1974 SNCZ, near Lubumbashi already electrified 25kV, 1st class cars stainless steel (Budd), then services more and more were interrupted, but later even a "luxe" on the section Mwene Ditu - Lubumbashi appeared. A sevice from Kabalo, but no longer from Lake Tanganyika, to Lubumbashi was listed e.g. in 2008. 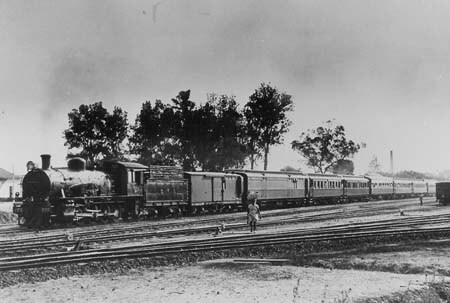 Lobito - Lubumbashi (Elisabethville), Companhia do Caminho de Ferro de Benguela (CFB) and LKD/KDL, Express de Luxe from 1931 in connection with steamers of Cie. Maritime Belge, CFB sleeping and dining-cars, service by CIWL, change of trains at Dilolo, later (obviously from Oct. 1938) sleeper Lobito - Bukama, Lobito - Elisabethville, dining-car Lobito - Elisabethville/ Tenke - Bukama. Colors: CFB cars brown/ocher. 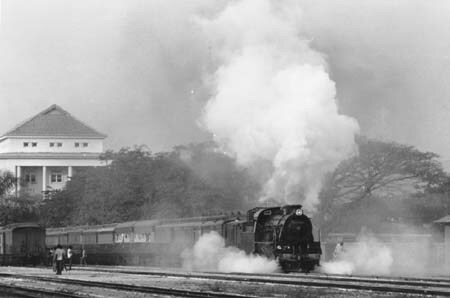 Train 51/52 was described also as Sud-Express and Kongo-Express. At least from the '60s coaches 1st and 2nd class are mentioned, with change of trains at Dilolo, then services were interrupted in Congo (Zaire) and around 1975 they were stopped by war in Angola. 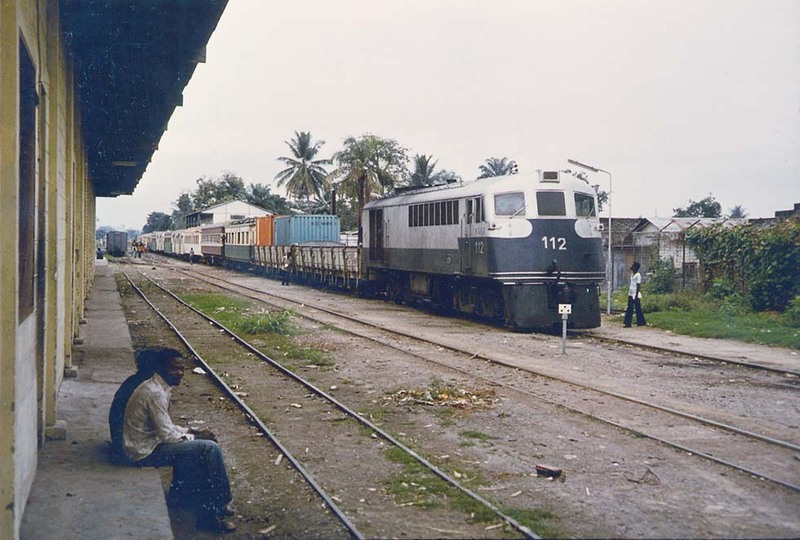 In 2005 Cook mentioned a twice-monthly train Dilolo - Lubumbashi and - "It may be possible on occasions to use freight trains to travel from Lobito to Luau" (the border station). CFB: Lobito - Benguela initially 4-8-0 (classes 7 to 9C). 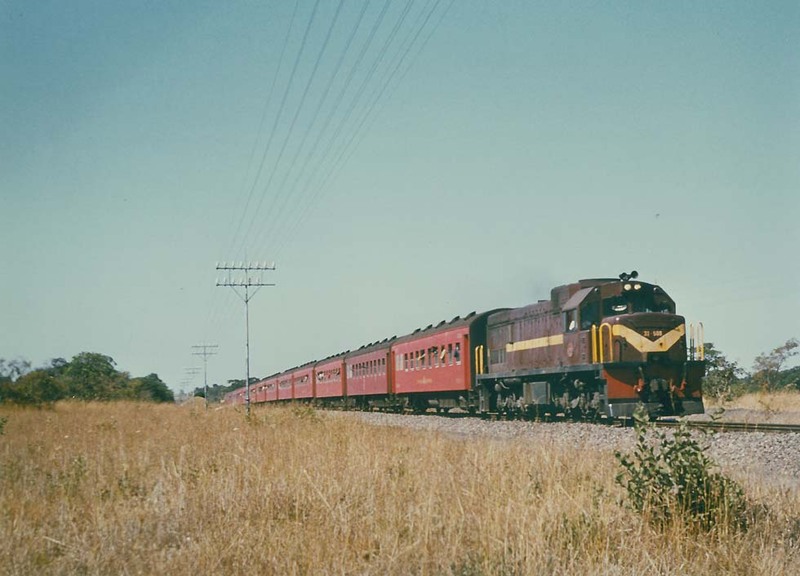 From 1926 to 1956 Garratts 4-8-2+2-8-4 (classes 10A to D) and in 1964 2-8-2+2-8-2 (10E, ex Rhodesia 16th) were introduced. On the Lengue gorge incline an additional rack-and-pinion tank engine was attached, until a new line was opened in 1948. Traction from 1951 by Mountain class 11, on the mountain sections by Garratts 10D. 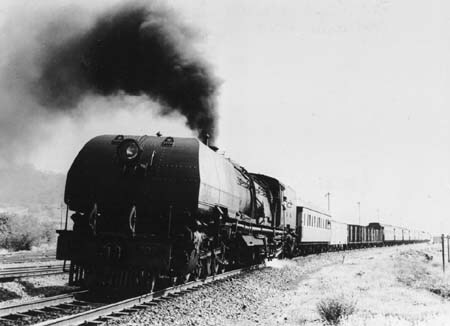 Passenger trains e.g. 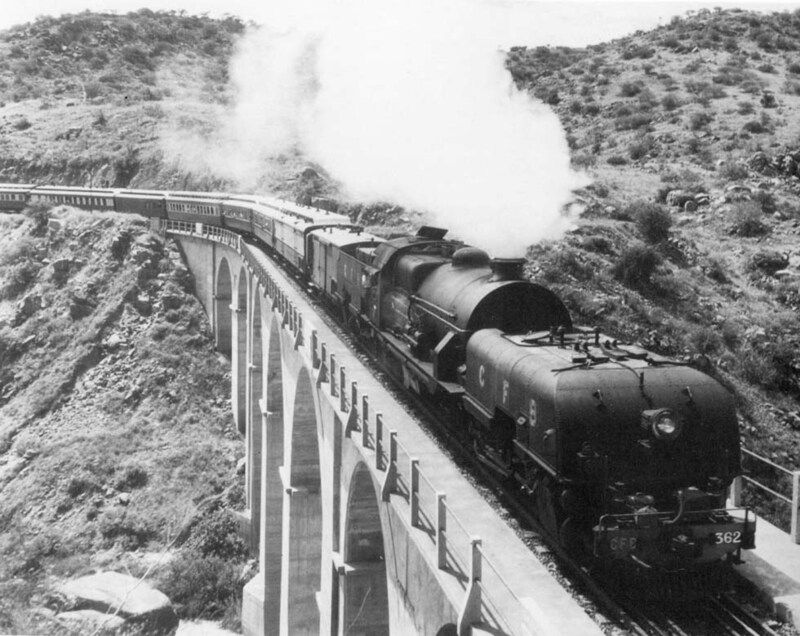 in 1972 Lobito - Benguela class 11, to Cubal 10D, to Nova Lisboa 10C, to Silva Porto 11 or 9C, to Luso 9C, to Teixeira 11. From 1972 diesel General Electric U20C for Lobito - Nova Lisboa, then Teixeira.Colors: Steam locomotives black/ red wheels, diesel silver/ red stripes. LKD/KDL: Initially 2-8-2, in 1939 and 1951 Mountains class 701 were built by La Meuse and Franco Belge, Dilolo - Mutshatsha until 1971/72, then diesels General Electric, Hitachi, Mitsubishi. Towards the '60s Kamina -, then Mutshatsha -Lubumbashi 25kVac, BoBo from Belgium. SNCZ: from 1974, heritage, BoBo 25kV Hitachi, diesels Hitachi and General Electric, possibly also leased from SAR. Colors: electrics green/cream. From 1909 at Sakania there was the connection with Rhodesia. Trains Lubumbashi (Elisabetville) - Sakania consisted of varnished teak cars. In the South of Africa, the upper classes normally had compartments with sleeping accommodation. 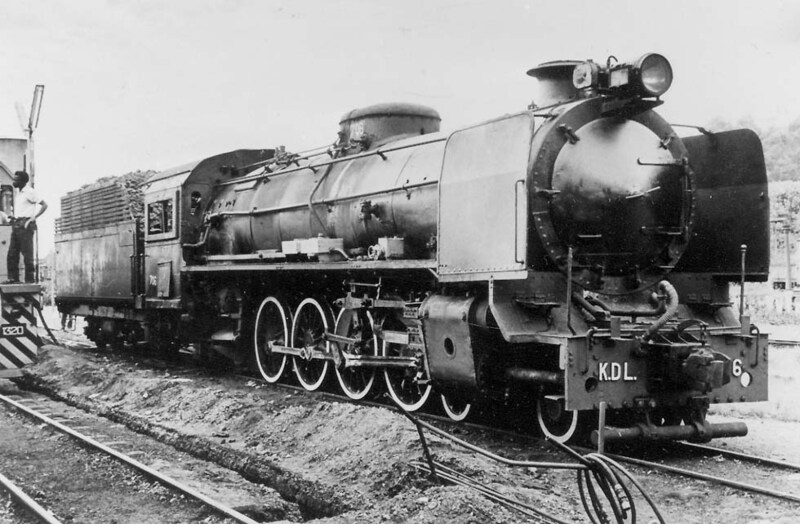 At the end of the '30s there had been expresses with LKD/KDL sleeping cars and CIWL service Elisabethville - Sakania, Sakania - Dilolo and diners Elisabethville - Sakania. 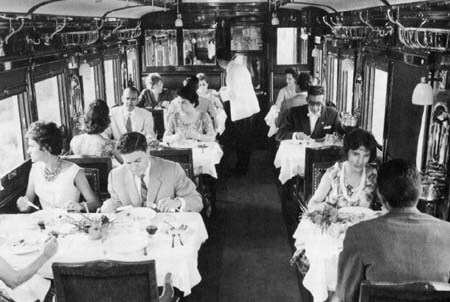 Around 1947 there was a Wagon-Restaurant-Bar and then, until 1963, a CIWL service on a KDL "Wagon-Lits mixte" Lubumbashi - Sakania. In the 21st century a once-weekly train from Lubumbashi to Sakania continued to be listed, but not any connection to Zambia..
From 1909 the predecessors of Rhodesia Railways (RR) provided a connection from Sakania to Bulawayo in Rhodesia. In 1929 the Northern Express or North Mail consisted of an 11th class Mountain and nine wooden cars, with diner and sleeping accommodation. In 1964 the service ended. 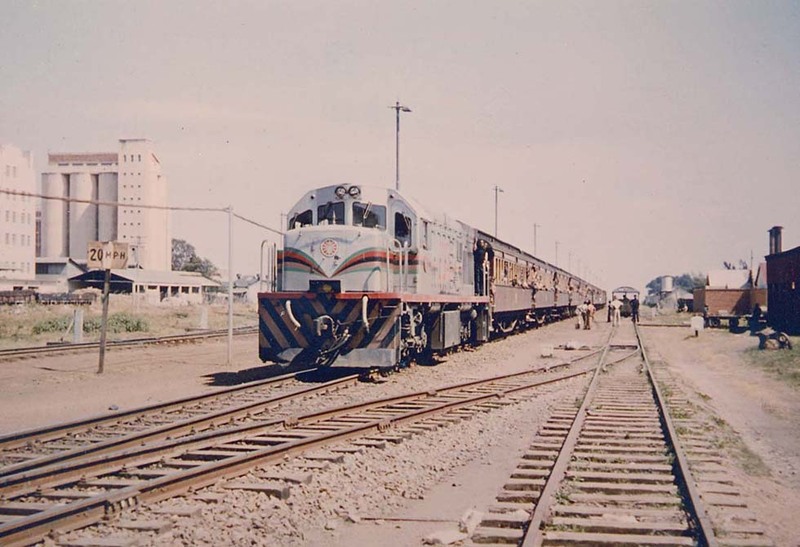 In 1967 Zambia Railways were founded. 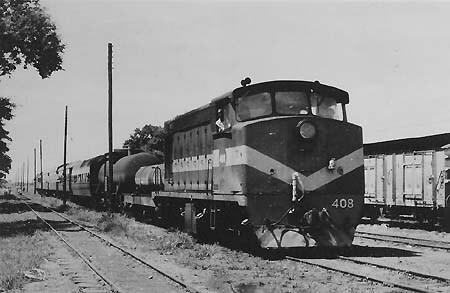 The "Mail" Kitwe - Lusaka - Livingstone consisted still of brown/cream colored RR cars, hauled by General Electric diesels, in 1970 replaced by Japanese railcar sets and in 1975 by the Kafue Express with dark-red Japanese cars, running until 1984. Traction by diesels General Electric, also leased from SAR. Train 1 Kitwe - Livingstone continued services. 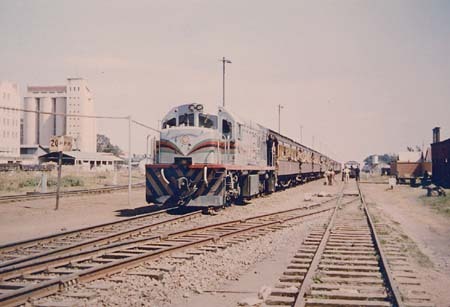 ZR trains Livingstone - Victoria Falls, restarted in 1983, were replaced by Victoria Falls Safari Express and Steam Africa Express, "depending on patronage". From 1976 arrived at New Kapiri Mposhi in Zambia the express from Dar es Salaam, consisting of Chinese cars 1st class with 4-berth, 2nd class with 6-berth compartments, 3rd class coach, diner and van, hauled by Chinese DFH2 diesels, painted blue/white and green/white. Later came grey Krupp diesels (GE license). Temporarily the service was interrupted. The Portuguese dream was a connection across Africa to Mozambique. That "C.F. 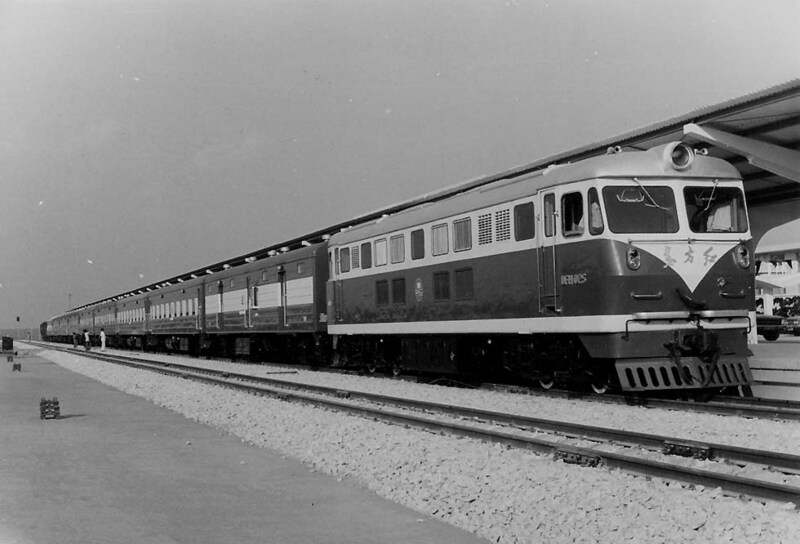 Atravez Africa" started at Luanda in Angola, but it remained a local line. 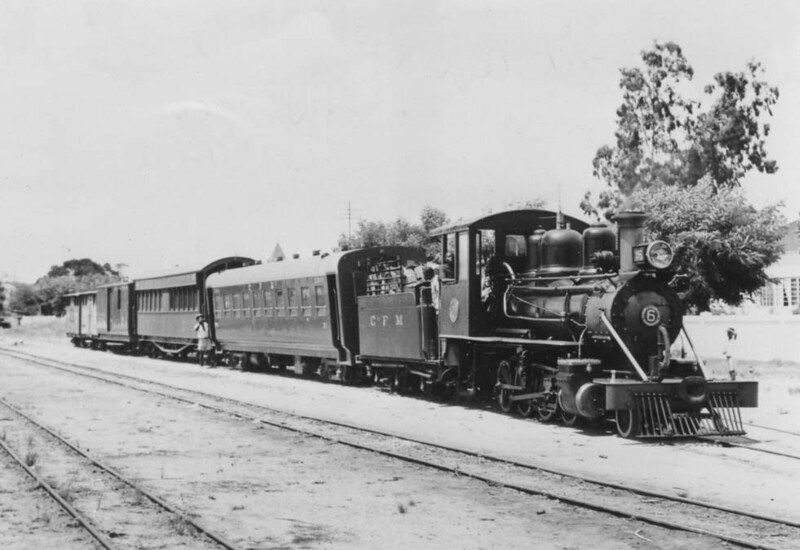 In Cecil Rhodes' empire the 2ft gauge Beira Railway was built, in 1898 completed between Umtali and Beira. From 1900 the Cape gauge mail train of the BMR, later RR, ran Salisbury - Beira. From 1935 Beira had its mail train to Nyasaland, now Malawi. "Shooting up the Malawi Mail" became the communists' hobby and in 1976 the railcar Blantyre - Beira was stopped. Passenger train services between Zimbabwe and Mozambique were interrupted, but within Mozambique and Malawi some trains continued running.